Curiosity required satisfaction with a closer inspection of a nest where geese were seen. These eggs proved the geese I spotted in the tree were indeed adapting to their environment. 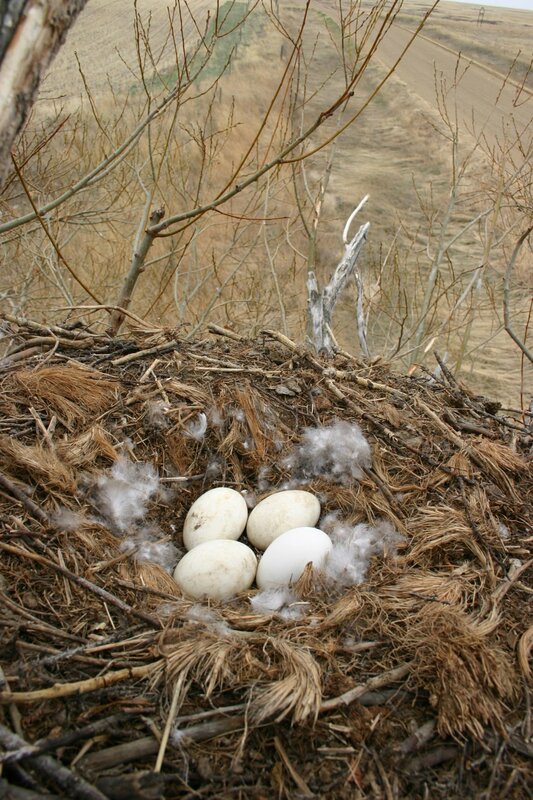 MAY 17, 2004 — Migrating Canadian geese usually nest near a water source. Howdy everyone! We’ve been graced with some amazing sunny days here on the coast lately, and rain, and giant storms, and amazing sunny days again. For my money I think this has been my favorite winter in Oregon in my eight years here! In a week we can experience every type of weather this state has to offer while the much of the rest of the country is under snow and extreme freezing conditions. The recent deluge of rain is putting our streams and rivers in good shape for steelhead this next week and the bay has been producing rockfish and crab for the very few people that have been going out. Last week I regaled you with the story of the goose and duck hunt that Hunter Marchant and I went on. This week I want to continue that theme by talking about one of our targeted species, the Canada Goose. This tasty and distinctive looking goose is known the continent wide and there are few people that could not point to a flock of them in the sky with their distinctive “V” pattern and tell-tale honking and not know what they were. These geese will fly from as far south as Northern Mexico to as far north as Canada’s northern territories. On rare occasion some of these birds will even migrate as far as Northern Europe, I have no idea how they do this but it may have something to do with all the credit card air-miles that are never redeemed nation-wide; Its only a working theory mind you. What we in North America loosely refer to as the Canada Goose can in fact be one of up to eleven sub-species, many of these distinctions are geographic but there are some genetic differences as well, mostly related to size from what I can figure. A biologist of some note recently suggested differentiating these birds into six species and two hundred subspecies. Yeah, I said two hundred. This dude has far too much time on his hands and an unhealthy interest in geese. I’m going to assume he still lives in his mom’s basement and doesn’t date much. With most of the migratory versions of the Canada Goose reaching upwards of six to thirteen pounds these birds are heavy, and of course made of meat, which is why folks like me hunt them. In fact, they are so sought after that over two million of these flying goose dinners are harvested annually but don’t despair, there are literally MILLIONS of these things. The latest stats I could find were from 2013 and those numbers show over five million breeding age geese in North America. That’s just the mature middle age geese and not the juvenile or older ones. In fact, numbers seem to show that we have more Canada Geese in North America than we ever have in history. Every spring a mating pair of geese will lay an average of five eggs with the female doing most of the incubation and the male standing guard. These nests are usually in an aquatic area on a raised bed but years ago I had personally witnessed a breeding pair with eggs in a nest in a tree, no joke. It was a prairie area and the nest looked like it could have been an old one made by an eagle or something of the like. It is also possible that these crazy geese just up and built a penthouse suite on their own. When I originally saw the nest it was off a road in the middle of nowhere and I drove right by it after fully seeing the geese in it. About a mile past I pulled over and thought there was no way I saw what I did so I turned around, pulled into the ditch, jumped the barbed wire fence, climbed the tree and with my own two eyes confirmed what I saw. About half way up the tree the geese took off but not to worry I didn’t mess with the nest or anything like that but sure enough there were four goose eggs in it. If these eggs did what most goose eggs do the momma rotated them occasionally to evenly heat them and incubated them for about a month. Once they had formed to hatchlings the babies spent a day or two chipping away with a raised piece of their bill called an “egg tooth.” Once hatched the baby geese or “goslings” followed momma everywhere and fed on grass and bugs, sometimes for up to twelve hours a day just to get enough nutrition. At about month and a half to two months of age they began to fly and from this time on spent about the next year with their parents. After this these birds slowly went their own way, found a mate, and raised their own families thereby completing the cycle of life. When I first started writing this article and I was sharing the part about the goose nest in the tree I realized I sounded loopy and no-one was going to believe what I saw. I stopped writing and spent hours the next day going through all my archived photos from my years of doing outdoorsy things until I found the proof that you see here. To this day it’s the only time I have ever seen such a thing. The other accompanying photo is of a momma goose that would faithfully return to that exact mound in that swampy area every year for at least four years to make her nest. Nature is pretty special and sometimes being able to take a sneak peak into the private lives of critters makes it all the more special. Whether you are chasing steelhead or watching geese I hope to see you out there.